There are two sets of properties at play: properties that appear in the "About" section on the left-hand side of a record and properties listed when you're creating a new record. If you're a CRM admin, you'll be able to configure both sets, from CRM Settings. Use the first to choose which properties appear in the About card on your team’s records. “Title” is required, and the record cannot be created until it’s filled out. Note that any properties marked as required will appear when creating new records from both HubSpot CRM and HubSpot Marketing. While the manager can set up certain properties to appear within records for all, certain reps may have properties that are important to their individual processes. With that in mind, if you're not an admin, you'll still be able to add properties to the "About" card. 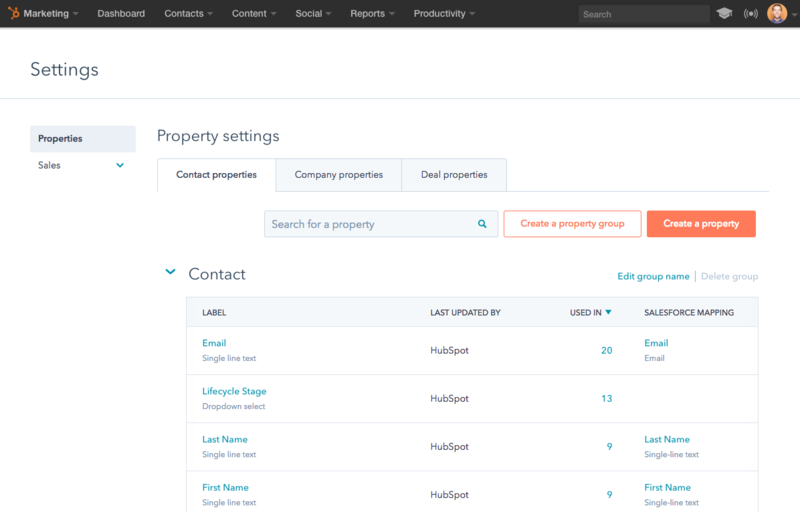 In any record within HubSpot CRM, click “View All Properties” in the About card. You'll see a consolidated column ("used in") that, when clicked, shows you the assets that use the list: Workflows, Lists, and Forms. In addition, if you use the HubSpot-Salesforce integration, you have a brand new column that shows you which Salesforce field the property is mapped to. Click into any property, and you’ll come to a new property detail screen, complete with all the information you’re used to, in a cleaner and more spacious form. Today, all HubSpot CRM portals, and any Basic, Professional, and Enterprise HubSpot Marketing Portals, have access to each of these three updates. Ready to start updating your property setup? Head over to your property settings now.